I love Joaquin Phoenix, but credit James Gray for not directing another picture that includes the guy; give somebody else a chance already, geeze. I’m not saying that Charlie Hunnam is as good as ol’ Leaf, but it is nice to see Gray work with a different lead actor, and Hunnam has been pushing himself lately, if not always successfully, so I applaud the guy for trying and was happy to see him here. I actually liked King Arthur more than most critics, and I also liked Tom Holland in this film more than I liked him in Spider-Man, so there’s that. AND I enjoyed Sienna Miller for the first time ever, probably because her role was small and she was allowed to be British. So, pieces taken together, The Lost City of Z was a movie that worked, both because of its parts and as a whole. Real life explorer Percy Fawcett spent his life searching for a city that everyone said couldn’t exist. A British soldier, Fawcett served his time all over the world, constantly passed up for advancement because of his family history, a black mark that followed him everywhere. But his background in cartography opened a door to decoration, if only he was brave enough to walk through. The Amazon jungles of South America were an uncharted wilderness that England had a keen interest in, due to the rubber farms that were popping up and producing millions of dollars. Fawcett’s job would be to take years away from his family, map the waterways, and report back to Britain. But what he found there went beyond national interests; evidence of a lost civilization that predated that of the white man, proof that the “savage” of the land was something much more than anyone had ever dreamed. I forgot to mention one other piece to the puzzle that I actually always enjoy and did particularly here; Robert Pattinson. I know, I know, Twilight, haha, yes I know, but the guy can act. Please watch him in other things, he has talent, and he is able to rise above YA and romance if he so chooses. Anyway, he’s just another reason to watch this film, and the movie itself is as good as the actors who pull it off so well. The true story element is fascinating, and had me immediately looking up more information on both the main character and the theories surrounding his expeditions. It’s an excellent time machine back a hundred years to an era that was so extremely different, and the period piece element was done very well. 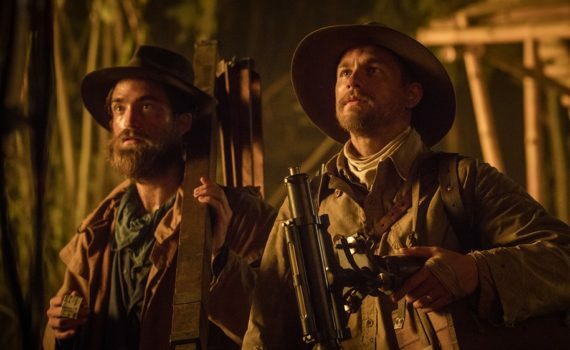 The story can become a bit slow, I wouldn’t recommend this film to everyone, but those who have an interest in anthropology & history will be hooked, and I think that The Lost City of Z is a Top 10 movie of the year, at least so far.